Used together with the foam toothpas. 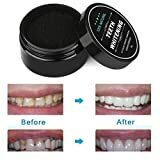 Package included: 1 pc teeth whitening powder. Remineralizing Formula With Organic Coconut Oil & Natural Minerals Georganics natural toothpaste with calcium carbonate and sodium bicarbonate cleans and remineralizes teeth naturally thanks to being high in minerals like calcium, potassium, magnesium and natural organic silica. This is the safest and mildest toothpaste formulated only with the best quality ingredients, all of which are organic and food grade certified. 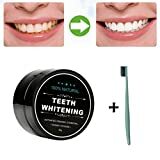 With Activated Charcoal and Anise Star (Vietnam) This toothpaste is blended with organic Anise Star Essential Oil and Active Charcoal from coconut. The oil is warm, spicy, sweet licorice-like aroma where the charcoal powder acts as a cleansing and whitening agent. Combined together you get a whole natural mild abrasive paste ideal to avoid commercial whiteners. 100% pure and safe formulation, perfect for all ages, kids above 12 years old. Directions With the spatula provided with your toothpaste, apply a pea-sized scoop onto a soft/medium toothbrush. Brush as usual for 2-3 minutes, leave longer for extra remineralization. 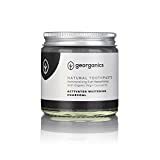 For a natural rinse complete by oil pulling with Georganics Organic Coconut Oil Mouthwash. Make sure no water enters the jar to avoid bacteria growth. Once the jar is opened store in a dry and warm place for up to 12 months. Since it’s blended with organic virgin coconut oil, the paste will naturally tend to solidify under 15°C-20°C.